Unleash the power of your data with self-service visualisations that uncover important patterns for organisations looking to better manage T&E spend. Have you ever felt like you have endless amounts of T&E spend data with no easy way to analyse or present it in a meaningful fashion? 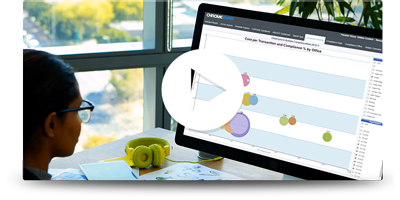 Chrome River DATA EXPLORER, powered by a world-class business intelligence reporting engine, uses compelling data visualisations that enable you to uncover critical insights about your T&E spend. Make data-driven decisions with DATA EXPLORER. Why wait for 10 minutes to pull a report when it can be done in seconds? We understand that your time is valuable, and that’s why we offer DATA EXPLORER – a tool that leverages powerful columnar database technology to ensure you get the data you need to make better business decisions. The columnar database stores information at a granular level, so when the data is pulled, Chrome River only reads that which is needed, instead of accessing all of the data – saving you valuable time. Trying to uncover insights from endless rows of data can be a daunting task. We can help. With our powerful DATA EXPLORER visualisations, you can easily identify critical spend patterns that may have been overlooked in text form. Our powerful visualisation tool provides actionable insights to help your organisation make smarter T&E spend decisions. Nobody enjoys sitting in dull meetings reviewing plain charts. With DATA EXPLORER, turn boring meetings into engaging interactive sessions with visualisations that tell a story. Understanding trends will help you provide a narrative about your organisation’s T&E spend and drive powerful change. Stakeholders will appreciate seeing data in a consumable way rather than reading boring charts. It’s a win-win. Many data analysis tools require someone with specific skills to administer the reports. With DATA EXPLORER you don’t need to be a data analysis genius. We have designed our solution to be simple enough that any user can easily build visualisations and explore the data with little training. White papers, case studies, analyst reports, videos, and more.